One of the biggest challenges for L&T was to ensure that the face of the Statue of Unity looks as close as possible to Sardar Patel’s face. Ready in a record 33 months, Prime Minister Narendra Modi today inaugurated Sardar Vallabhbhai Patel’s statue, known as the Statue of Unity, in the Narmada district of Gujarat. Against the picturesque backdrop of Vindhyachal and Satpura mountain ranges and the Narmada river, the giant memorial is the world’s tallest statue at 600 feet and is expected to be a major tourist destination in Gujarat. 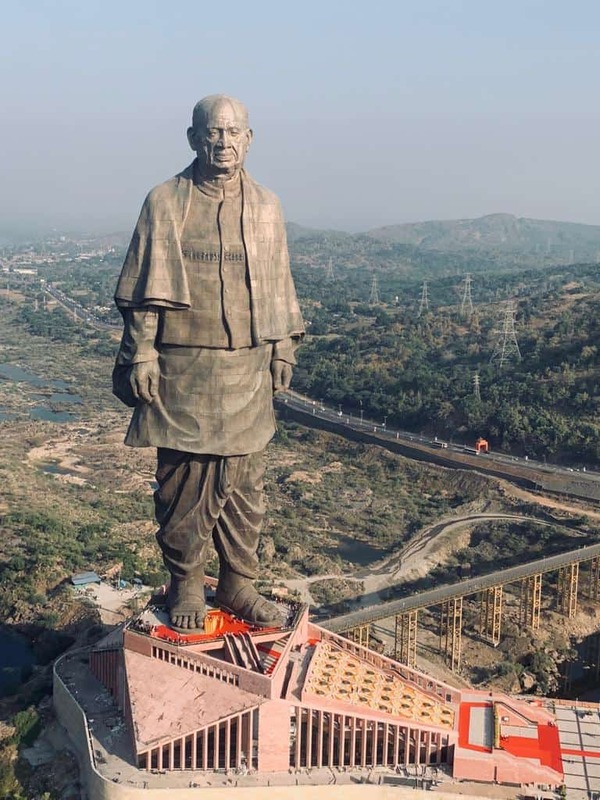 Conceptualised as Sardar Patel walking on the Narmada river towards the Sardar Sarovar dam, the design of the statue took a lot of brainstorming among experts due to various challenges related to its location, height and pose. The bronze statue now is nothing less than an engineering marvel. It was on this day, five years ago, when Narendra Modi, then chief minister of Gujarat, had laid down the foundation stone for the project. Now once again, on the occasion of Sardar Vallabhbhai Patel’s birthday, Modi was there at the spot, but this time to inaugurate the Statue of Unity as prime minister. The Sardar Patel statue is filled with 1,700 tonnes of bronze and 1,850 tonnes of bronze cladding made up of 565 macro and 6,000 micro panels on the outside. 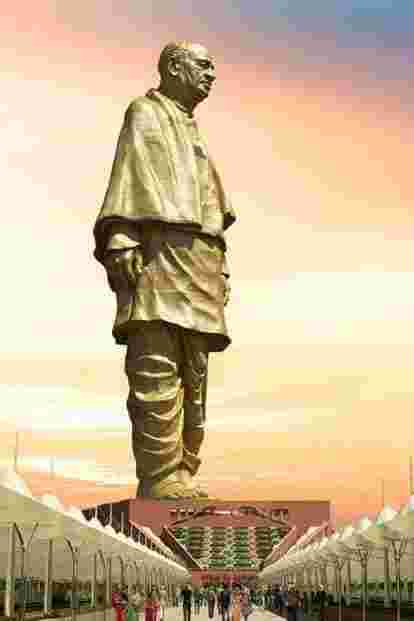 The Statue of Unity is so towering that even if you are 6 feet tall, the statue will still be 100 times than you. On the outside, the Sardar Patel statue is plated with 1,700 tonnes of bronze and 1,850 tonnes of bronze cladding made up of 565 macro and 6,000 micro panels. The core of the statue is made up of 210,000 cubic metres of cement concrete, 18,500 tonnes of reinforced steel and 6,500 tonnes of structural steel. A large team of over 3,000 workers and 250 engineers worked on the Statue of Unity for three years. 1. Larsen & Toubro Ltd, which designed and executed the project after winning a tender, deployed a team of over 3,000 workers and 250 engineers. Although the statue was designed and made in India, the bronze panels had to be cast in a foundry in China, since no such facility to handle such a huge project is available in India. Although designed as a memorial to Sardar Vallabhbhai Patel, the Statue of Unity complex has several attractions for tourists including the valley of flowers and a panaromic view of the Sardar Sarovar dam and Narmada river. 2. One of the biggest challenges for L&T was to ensure that the statue looks as similar as possible to Sardar Patel. For this purpose, they hired well-known sculptor Ram V. Sutar from Noida, who went through over 2,000 archival photographs of the “Iron Man" and spoke to several historians and those had seen him to come up with the design matching Patel’s bodily and facial features. Built at a cost of Rs 3,000 crore, Sardar Patel’s Statue of Unity is twice the size of the world-famous Statue of Liberty in New York. 3. For the construction of the statue, the engineers had to be extra cautious in ensuring that the monument had the capability to withstand heavy winds of up to 130km/hour and earthquakes measuring up to 6.5 on Richter scale. They also used two tuned mass dampers of 250 tonnes each to ensure that in any given situation the base of the structure always remains rooted. The bronze panels on the Statue of Unity were cast at a foundry in China as no such facility is available in India. 4. Another headache for engineers was the walking pose of Sardar Patel, which meant that the statue is the most weakest at its base as there is a gap of 21 feet between the two legs. Keeping the legs of a statue together helps balance its weight. 5. The engineers adopted sophisticated state of the art technologies like light detection and ranging technology and telescopic logging to assess rock joints. The development of the Statue of Unity went through several stages of mock-up, 3D scanning and computer numerical control production to ensure accurate reproduction of minute details.